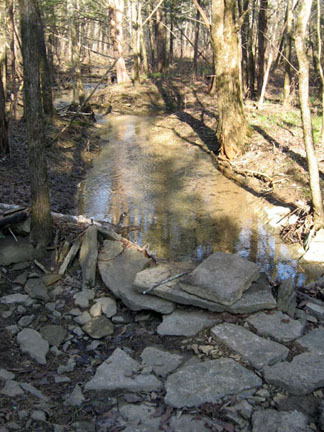 I had run the Bryant Grove Trail a few times, many years ago. It was easy with little elevation gain. Afew weeks prior to our walking the trail we visited the Park and wanted to walk the trail, but could not because we had our dog with us. Directions: From Nashville take I-24 east (about ten miles) to exit 62, Old Hickory Blvd (TN 171 N). The Park is reached in a little less than 7 miles. Along the way the Old Hickory changes names to Hobson Pike. Turn right with good signage (the first right after crossing Percy Priest Lake.) The Park Office is the first right. Continuing on the Park Road, go left at .40 miles following the sign to Couchville Lake. The trailhead for Bryant Grove is to the right of the parking area, near the playground. Information on the Park is available at the Park Office. Park at the Couchville Lake Picnic Area. Water, restrooms, and vending machines are available in the picnic area. The Bryant Grove Trail begins at the end of the parking area near the playground. Directions will only be given for the one way from Couchville Lake to Bryant Grove. A narrow trail leaves the trailhead and soon bears right joining an old road bed. Follow the gravel road as it follows the lakeshore. One of the nice things about the trail is there are mileage posts in half mile increments over the entire trail. The markers make it easy to know the exact mileage. Most of the markers also have a bench nearby. Shortly after the half mile marker, the trail leaves the shore and begins to climb a small hill. Near the crest of the hill a sign indicates that the trail is not a loop. In other words it is not a four mile trail, but an out and back - eight mile trail. After .15 miles an old stone fence may be seen on the right a short distance off the trail. The one mile post is just before a turn to the right. Heading on a slight descent an old creek bed is on the right. Back in the trees the one and a half mile post is passed as the trail returns to the lakeshore in about a tenth of a mile. Following the water's edge the trail continues close to the lake until the two mile mark. At two miles a bench is provided as well as a trail kiosk with a map. Turning around and returning to the trailhead is a 4 mile round trip hike. Starting again the trail crosses a good sized creek in just a few feet. This drainage is flooded in high water. The trail goes from tree cover to open field and back again as it continues. The open field roads may be confusing at times, just look for trail indicators. After the 2.50 mile post the trail goes into the Bryant Creek drainage. In .20 miles the trail crosses a good bridge over the creek. 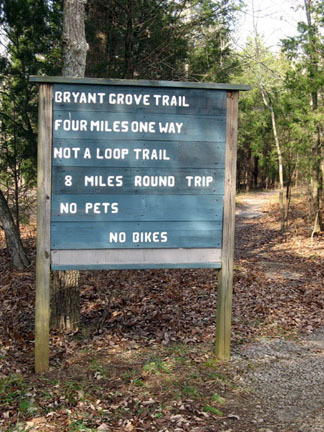 A sign directed to those coming from Bryant Grove repeats the "Trail Does Not Loop" info. Shortly after the 3.0 mile post the trail crosses another drainage. Trail work has replaced the old bridge with culvert pipes. Continue to look for trail indicators in the open areas. Pass the 3.5 mile post and continue to 4.0. Oops, the trail does not end there. It is a little farther (.10 miles) to the Bryant Grove Picnic Area. There are restrooms and water available at the picnic area. Turn around and retrace the trail. It always looks different from the other direction, but it is still 4 miles back to the parking area.